Sailing across continents and touching new shores every other day aboard a luxurious vessel gives you a taste of the ultimate regal lifestyle. Your travel portfolio is incomplete unless you have taken the quintessential cruise. It is the most magical experience of one’s life to take an all-inclusive cruise. Cruising enlivens the mind, body and soul in unmatched ways. If you haven’t boarded a cruise ship to your desired destination, allow us to share details about Alaska, Caribbean, Mexico, Asia, Africa, Bermuda, Australia, New Zealand, China, Canada, New England, Egypt, Russia, Panama Canal, Galapagos Islands, Greenland, Arabian Gulf, Tasmania, Northern Europe, Southern Europe, Western Europe, Eastern Europe and many more adventure-filled destinations. eTravel.com offers multiple services including Flights, Hotels, Cars, Cruises making it the ideal website for all your Travel Needs. 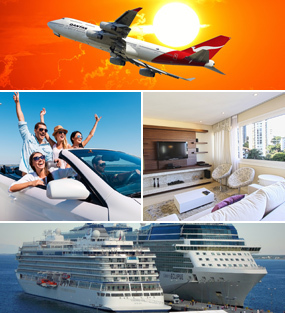 eTravel.com offers user friendly web services that allows you to book travel with extreme ease. Contact us at [email protected] with any booking related inquiries.